New Concrete Sealer Products, Best Concrete Sealers, Trusted Epoxy Floor Coatings. 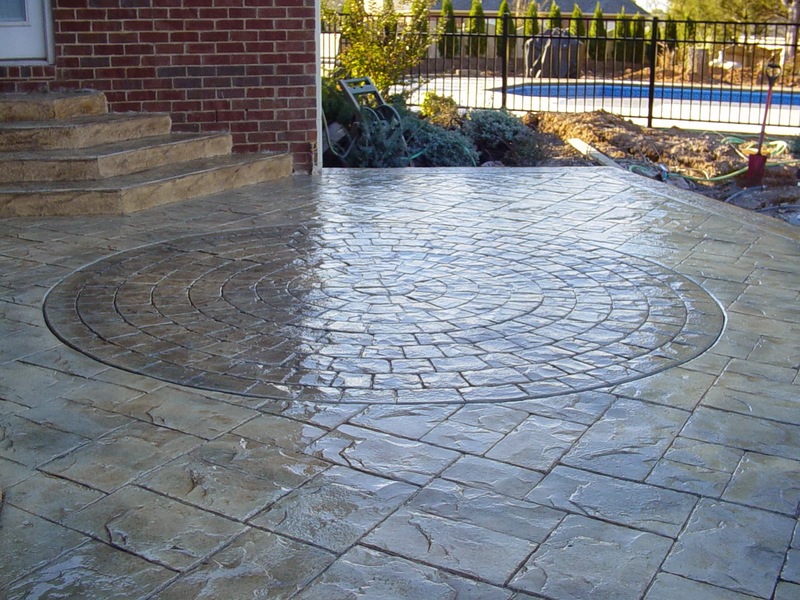 Shop our selection of Concrete Sealers at Surface Koatings Inc.
You've just installed the decorative concrete masterpiece of your dreams. Maybe it's a pattern-stamped pool deck or patio, an interlocking paver driveway, an acid-stained floor, or an exposed-aggregate walkway. Protecting and properly maintaining that concrete with special concrete sealers will keep it looking spectacular for many years to come while extending its service life. And even if the surface begins to show wear after years of exposure to traffic and the environment, you can often restore its original beauty with special cleaning, stain removal, and polishing products like our epoxy floor coatings. Surface Koatings, Inc. is an independently owned and operated professional concrete coatings manufacturing company that was formed in 2000. With over 100 plus years of combined specialty coating manufacturing and formulating experience, our current product categories include but are not limited to; epoxies, polyurethanes, polyureas, solvent based acrylic concrete sealers, waterborne acrylic concrete sealers, water repellents, concrete acid stains, water based concrete stains, interior concrete dyes, exterior UV resistant concrete dyes, SP Systems sprayers, application tools and equipment, VOC compliant concrete sealers and coatings, coatings strippers, cleaners, etching solutions, chemical scents, industrial floor wax & polishes, concentrated color packs, liquid release agents, surface retarders, and form retarders. Surface Koatings, Inc. also offers a very attractive private labeling program, custom formulations and blends, and competitive toll blending operations. We encourage you to contact us to learn more about how our experience and dedication to customer satisfaction can help you. We have a fully trained and knowledgeable staff that offers excellent technical and customer support. Be sure to Like us on Social Media. New Products from Surface Koatings, Inc. Surface Koatings, Inc. is proud to announce a new line of reinforcement in the battle against salt and water on concrete. These revolutionary new products offer a variety of finish options for new pours and old concrete. Repel Cure, Deco Guard, and Deco Guard Plus offer superior water repellency and protection from de-icing salts, salt water pools, and stains due to their proprietary chemical reactive water repellent chemistry. Call today for more information. 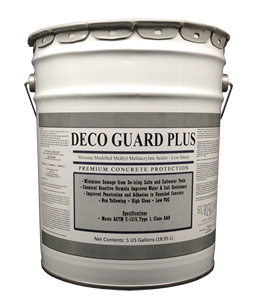 • Use as cure & seal or on unsealed concrete. • Doesn’t change appearance of concrete. • Great for driveways and sidewalks! • Meets cure & seal specifications. • Low Gloss, penetration & color enhancement. • Great for pool decks & courtyards! • High gloss and color enhancement. 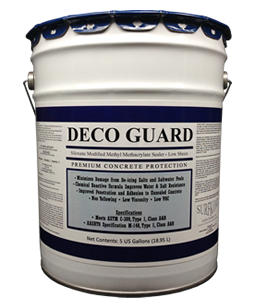 • Great for colored concrete! *All three products meet US EPA, OTC and CARB VOC Regulatory Guidelines. Prepping your concrete surface before applying the concrete sealer. Concrete surface must be clean and free of all contaminants and water. Do not apply if rain is forecast within 24 hours. If moisture is present or if the surface is not clean and free of all contaminants, the sealer may have white spots and have premature delamination and failure.May be applied when damp (not “wet”) to freshly placed concrete surfaces as a cure & seal. Application of the Concrete Sealer. Apply using an 3/8” long nap roller cover using long even uniform strokes. An airless sprayer containing a .519 tip size may be used as well. Thick or puddle areas may prevent the solvent from evaporating and may be susceptible to moisture intrusion which may cause milky white spots. Applying too thin may cause sealer to prematurely delaminate, flake or wear away. Allow sealer to dry for 24 hours for light traffic and at least 48 hours for heavy traffic. If applying two coats, wait approximately 4 – 6 hours between coats. Announcing New Website Launch for Surface Koatings Inc.